Students from the UNC-Charlotte School of Architecture visited the CHS Northeast Modernization project site this week. 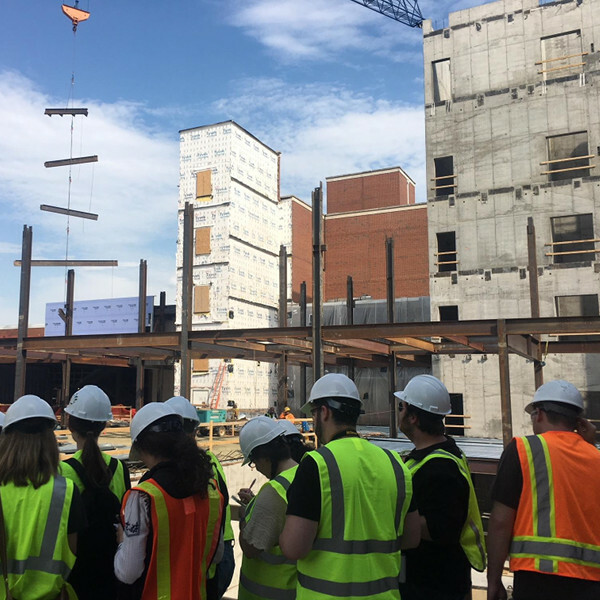 Casey Werner, PE from our office, and representatives from Robins & Morton and Wright McGraw Beyer Architects gave a tour of the project for 25 students. The project is a $86 million expansion, constructing 165,000 square feet of new four-story bed tower for the cardiovascular facility including a new cath lab, cardiovascular ICU, pre- and post-op care, and a nuclear medicine department. ColeJenest & Stone is providing Civil Engineering and Landscape Architecture design. CJS loves welcoming students to its project sites. Casey explained the opportunities and challenges of expansions on an existing hospital campus and highlighted the tunnel that was designed to handle existing and new utilities in the project area.